Turntables had become an obsolete instrument after CDs and cassettes had taken over the market. Due to large size and difficult portability, turn tables had lost their charm and people were no longer interested in buying record players. However, with the trend for DJship returning through clubs, Vinyl records and turntables have made a comeback and are now being used in many music fields. Turn tables are actually the pioneers of music players and probably the first invention that could bring us anything close to listening to music. It was first designed in the late nineteenth century and since then improvisations with a touch of technology and finesse has brought it shoulder to shoulder with the modern music players and devices. It may not match them in size and portability but it definitely has its say when it comes to sound quality. There a basically two types of turn tables i.e. Automatic turntables and manual turntables. Manual turntables are old fashioned classic turntables where the user had to life the tonearm and place it on the vinyl record. It also produced quality sound and was quite more fun. An automatic turntable, however, does not require any lifting and placing. It runs with a simple push of a button. The sound quality is not as good as manual turntables but it is more convenient option especially if you have kids at home who can potentially damage the tonearm. If you have made up your mind about buying a new turntable, there are few considerations that you should make before purchasing a new player. This article will help you understand the basic specifications of a turntable so that you can buy a turntable according to your liking and that too at a low cost. Some of the major features and specifications of turn tables are outlined in this article that will help you make you purchase decision clearer and easier. We shall first see the basic elements that make a turntable. These components are important to know about because then you won’t be fooled by your supplier. Motor is responsible for the rotation of the floating platform. Its specifications are probably the most important feature in a turntable because the rotating speed of the motor is critical for the performance of a record player. There are mainly two type of motors used in a record player. You can go for either of the two types. Both have their pros and cons and it mainly depends upon the installation and your requirement of sound quality. Belt drive turntables have lesser effects of vibration because the motor is attached at a certain distance from the floating platform. The motor is connected via a belt. The belt is made of rubber so it absorbs all the vibrations from the motor. The sound quality is therefore much better. One drawback of belt drives is that the belts tend to age with time and therefore gather dust and other impurities causing hindrance in smooth rotations. This affects the sound quality quite a bit. On the positive side, these belts are cheap so they can be replaced easily. Direct drive recorders are normally preferred for commercial use by DJs and sound players. Its construction is compact and therefore transportation is easy. The motor is attached directly under the floating platform which gives it the name of a Direct Drive turntable. The disc can be rotated backwards with hand without damaging the recorder which is one reason that DJs prefer it. The speed is consistent and reliable. Due to direct connection with the motor, these players are prone to vibrations and distortion in sound. To compensate for it, companies now use dampers between the motor and the platter. The platter is basically the floating or rotating platform in which the vinyl record sits. Once the system is powered on, the platter rotates and the needle above it traces the data from the disc to generate musical sounds. Between the vinyl record and the platter, a rubber mat is used which is referred to as the “slipmat”. It is used to prevent the disc from slipping and rotating in synchronization with the platter. These rubber mats are used mostly for homes because there is no need of reverse rotation of the disc. However, the DJs and commercial users prefer not to use rubber mats as they have to create sound effects by rotating the disc back and forth at their own will. The platter keeps rotating so that the motor is not damaged. However, the disc on top can be rotated in any direction by hand. The stylus is contained by a cartridge. This cartridge is held by a tonearm. The principle is to extract the signal in form of electricity which is then fed to a speaker that converts it back to sound. There are two main types of a stylus. A P-mount styles contains four connectors which are plugged directly to the tonearm’s open end. A half-inch mount has contains wires connected to the part of tonearm. We have discussed the basic features of a turntable which are of supreme importance. However, there are a few additional features that are needed to be addressed. A know how of these features can help you buy a much more efficient turntable at a reasonable cost. They can help you select a turntable according to your choice of music because these features are known to produce variation in the sound quality. Cartridges directly affect sound quality. In case the cartridges are not in the best condition, they can considerably reduce the sound quality. This feature is used to adjust the speed of your tracks. It allows you to check whether your record is playing at an optimal speed. It is used for speed calibration and to check what speed the player is operating at. These are optional features and available in most turntables these days. They are more useful for DJs in rooms having dim or low lighting schemes. The lights give a turntable more of a modern look. Phono preamps are used especially with the older turntables. Turntables receive phono input which is not compatible with most modern receivers. 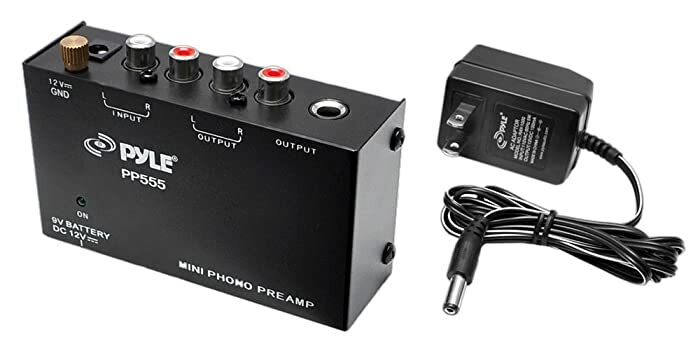 The phono preamps are used for adjusting the sound level before it is fed to a receiver. It is an optional feature and more suitable to prolong you turntable’s life and keep it clean. It is simply a lid that covers the platter and the tonearm so protect it from dust and impurities. It also shields the Vinyl record when it is playing. Buyers should keep in mind that the types of different features are intended to extract different sound quality and address to different applications. Therefore, customers and buyers should know exactly where they want to use their turntable. It remains usable for any type of location and surrounding but specific features work best in the compatible conditions. Turntables are available in most of the local markets. However, if you wish to buy classic vintage record players, websites such as Amazon are probably the best place. You can choose from a wide variety of features and specifications and users can save some valuable transportation charges by simply ordering the products from home. Vintage turntable lovers can now enjoy the same sound quality through the modern record players. Vinyl records are preferred and still loved by million around the world. They are commercially used by DJs as well so they have a definite market. Since turntables have been acquainted with the modern technology, they have made a comeback and are now being used widely. Their popularity index has shot up considerably. They are now widely used at homes, picnics, dance parties, weddings and concerts. Since the popularity has increased, more companies have taken up the production of turntables and the competition in the market is now quite tough. For vintage product enthusiasts, turntables are now more of a collectible item so they seek for older and used record players. Now when you go out buying your very own turntable, you know exactly what features and specifications to look for. We suggest you to seek a belt drive turntable for your home but then again, the choice is yours. If you have a turntable and you wish to upgrade it with accessories, you should seek upgrading recommendations and accessory addition to your older turntable. This will help you to enjoy the older day tracks with your older turntable with a touch of modern technology. These accessories will help you upgrade your record player and celebrate one of the most innovative gadgets ever invented.